In "Allergy Free", 25 leading physicians explain the techniques and natural substances that brought recovery to their patients. Explore dozens of self-help options for treating allergies without drugs in an interactive cross-referenced format. 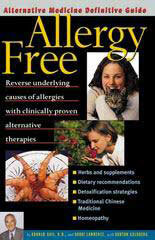 The authors of this thoroughly researched book designed it as an educational tool to help readers choose the best course of treatment and prevent allergies from developing in the first place. Konrad Kail, N.D., co-owner of Naturopathic Family Care in Phoenix, is a member of the Advisory Council to the National Center for Complementary and Alternative Medicine (NCCAM) at the National Institutes for Health. How to be your own allergy detective. How to build up your body's defenses against allergies. How to allergy-proof your home. Why we're having an epidemic of asthma. Why it's important to eat a varied diet. How vaccinations and antibiotics set the stage for allergies. How stress contributes to allergies. Click the button below to add the Allergy Free to your wish list.